I always thought the point of an advent calendar was to count down to Christmas, having a little chcolate and Christmas picture everyday until Christmas Day finally arrived. Now though, the chocolate is mostly crap, unless it’s Cadburys, you don’t get a picture anymore and then there’s the stupidly priced advent calendars filled with toys. Hold on, do we not spend enough on our little darlings without being blagged into spending £40 on an advent calendar?! I’ve always thought the wooden advent calendars look really nice and you can fill them with whatever you want, providing it fits in the box, which is good if you don’t necessarily want your little one having chocolate before breakfast every day! You can get some lovely Christmassy hairclips for little ones and the supermarkets often do packs of these quite cheaply and you can then put a pair in every few days. I’ve found some nice ones in Primark this year in the ladies department which will be fun for the big one to wear. I used to love getting cute Christmas bobbles and putting her hair in little bunches and trying to get the snowflakes to both face the same way. The little soft bobbles are perfect for fitting in the tiny boxes. Of course there has to be sweeties in an advent calendar, but rather than chocolate every day, a couple of Haribos is always popular in our house. This year I have found some cute Christmas earrings £2 a pack from Primark and a pair of these every few days will be a good little surprise. The key is finding chocolates that are small enough. In the past I have bought chocolate and then realised it won’t fit in the little boxes. This year I’ve found some nice ones in M&S, we’ve got chocolate sprouts, caramel filled presents and chocolate penguins but the supermarkets all do little nets of chocolates, like these Tesco ones. Whatever’s leftover can be chucked in the stocking for good measure! And lastly, if you find stuff that won’t fit you can always leave a note, like a treasure hunt, or it can be from the Elf, if you’re doing Elf on The Shelf- there’s a post to come on that. Every year I think about doing something like this… and then panic buy a naff chocolate one – whatever’s left on 2nd December! Some fab tips in here. I always go for the chocolate snowballs as they are the only thing that fits in but love the idea of putting different things in. My little girl will love hair clips and I’m thinking my little boy will love the odd marble to add to his collection. Thanks for the tip! i’m planning on letting The Boy make one with toilet roll tubes…have brought a naff one in preparation for failure!! I love the earings one! And I love the reindeer! The days are coming! Time to make something is here! Thanks for this wonderful ideas! Hi Fran, I love these sort of advent calendars. I did say I would get both my children one for this christmas but I’ve failed on that note. Definitely one for next year though. I think they are so much more personal and a lovely keepsake for them too. Great ideas for filling them too. My daughter would love them. I didn’t buy the kids advent calenders this year but my mum bought them advent cusions which I thought were quite cool. This year though I’ve given in and bought them crappy chocolate calenders even though I hate them which funnily enough ive just written a post about. (Unhinged mummy stopping by from #marvmondays). I love your reindeer advent calendar. I can’t wait until Baby Bee is a little older and i can start filling one for her. Hopefully she’ll have more hair then too! I love the idea of giving little gifts for advent, so much more fun than a standard chocolate calendar! I bet! Its tough finding things small enough! Oh no! Aldi did have some nice ones actually! 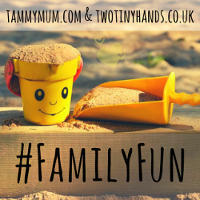 Great stocking filler ideas here! I really need to visit Primark. 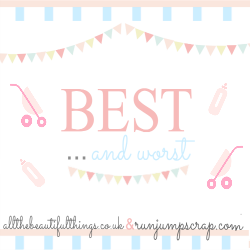 Popping back from #bestandworst thanks for linking! Some great ideas! I’ve just got Edith (and myself) a Malteaser one this year. Everyone’s putting me to shame haha!